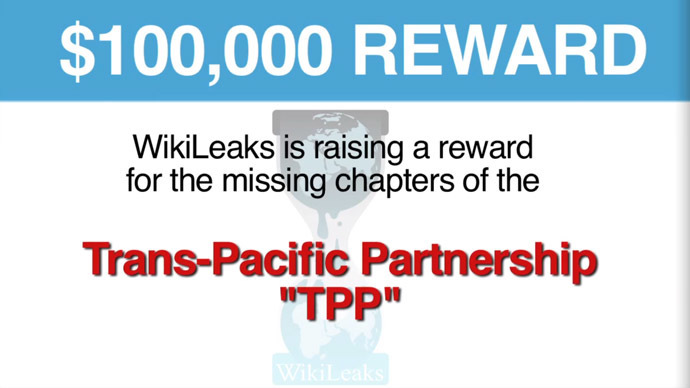 WikiLeaks is attempting to raise $100,000 to be used as a reward for the remaining chapters of the Trans-Pacific Partnership (TPP) trade deal. The organization referred to the chapters as “America's most wanted secret” while appealing for funding. The announcement to crowdsource the bounty was made in a Tuesday statement. It marks the beginning of a new program for the organization, allowing supporters to pledge funding towards the hefty sum. “The transparency clock has run out on the TPP. No more secrecy. No more excuses. Let’s open the TPP once and for all,” WikiLeaks founder Julian Assange said. “It is a one-way ticket. Once signed, it will be locked in place for decades. But the scariest thing about the TPP is that there are 26 chapters that carry our daily lives that we have not seen,” it adds. The video encourages supporters to spread the word on social media under the hashtag #LeakTPP. It provides the internet address where donations can be made. WikiLeaks says the treaty is aimed at creating “a new international legal regime that will allow transnational corporations to bypass domestic courts, evade environmental protections, police the internet on behalf of the content industry." The whistleblowing platform has already published three leaked chapters of the draft, but hopes the reward will result in a full copy of the deal. The previously leaked chapters include sections on intellectual property rights (published in November 2013), the environment (January 2014), and investment (March 2015). The TPP, a key part of President Barack Obama's pivot to Asia, aims to counter China's rising economic and diplomatic power by developing a partnership in the Asia-Pacific region. Along with the United States, 11 other countries have taken part in TPP negotiations: Australia, Brunei, Canada, Chile, Japan, Malaysia, Mexico, New Zealand, Peru, Singapore, and Vietnam. The deal would exclude China and serve to counter its influence in the region. But those critical of the deal – including labor unions and the Tea Party – say it would hurt US workers and the economy, while rewarding big business. Calls for TPP transparency aren't only coming from WikiLeaks – two Senate Democrats made similar calls in May. In May, the US Senate passed a fast-track bill which would give Obama the power to negotiate trade pacts with other countries and submit them to Congress without lawmakers being able to introduce amendments to them. The House is expected to vote on the bill this month.